As you may know, I have been working with Support Debugging Tool since the pre-release of build 9 and have been a contributor to the development and beta testing of the product since that time. Today marks the release of Build 11, the third installment of the product, in a marathonic 130-hour development effort by my friend David Musgrave. Read what David has to say and the myriad of enhancements introduced in this build in his release notes article. The focus of this post is the new Company Colour Coding feature. 1) With the introduction of Microsoft Dynamics GP 10.0 came the release of the Single Document Interface (SDI). SDI is a method of organizing graphical user interface applications into individual windows that the operating system's window manager handles separately. A window does not have a "background" or "parent" window containing its menu or toolbar; instead, each window contains its own menu or toolbar. Release 10 marked the departure from the Multiple Document Interface (MDI) that was known to hundreds of thousands of users around the world for more than 20 years. However SDI introduced another challenge to the user community and the question did not wait: "I used to work with multiple instances of GP at the same time and had no problems differentiating my sessions. With this new interface how can I tell my companies apart?" While the usual response to this question was the company name on each window, this did not stop users from expressing their frustrations due to costly data entry errors, especially for users working in Terminal Server and Citrix environments. 2) Systems administrators always faced the challenge of clearly differentiating Microsoft Dynamics GP test and historical companies from their production counterparts, even with the introduction of the 'TEST' and 'HISTORICAL' tags in the company name to display a warning at login time, it was still not enough and could not save some users from entering transactions into the wrong company. For more information on setting up test and historical companies, click here. Let's see how colour coding can help! Support Debugging Tool now allows system administrators and support personnel to clearly distinguish Microsoft Dynamics GP companies by implementing colour codes for each company. In the case of scenario 1 and 2 above, conceivably, each production company could have varying colours, but all test and historical companies could be assigned a red colour, in which case all windows would inherit such colours. 1) Open Support Debugging Tool. 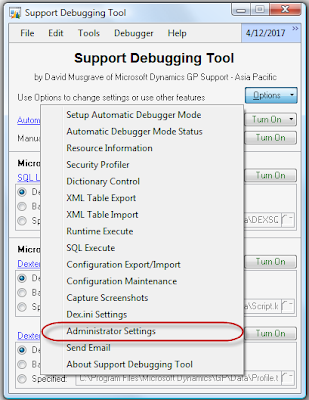 Go to MSDGP > Tools > Support Debugging Tool or press CTRL+D on your keyboard. 2) Click on the Options button and chose Administrator Settings. NOTE: The Administrator Settings option is only available when using the Advance Debugging Mode. For more information on how to enable the Advance Debugging Mode click here. 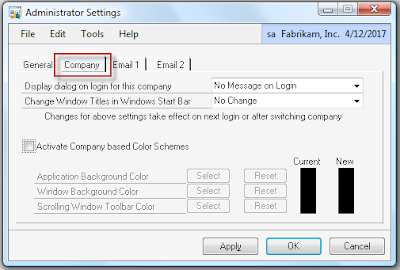 3) In the Administrator Settings window, click on the Company tab. This will display the options available to configure colour coding. You can choose to display a dialog on login for test and historical companies along with displaying the company, user, or both on each window title. In any case, changes will not take effect until you log off and log back into Dynamics GP by either switching companies or by exiting and re-entering the application. 4) Activate company colour coding by clicking on the Activate Company based Colour Schemes checkmark. 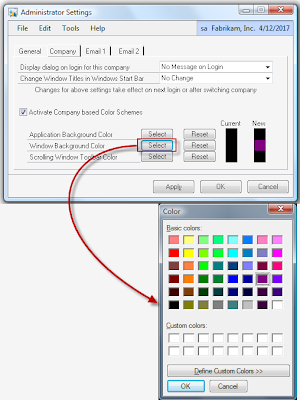 You can then select colour schemes for the application background, windows background (recommended), and scrolling windows toolbars. Consult with your users to establish the best schemas for their needs and be sure to circulate an email with the chosen schemas. 5) Click on the Apply button in the Administrator Settings window to acknowledge the changes. Support Debugging Tool will then change all windows background, in the case of this example, including its own. Below are a few samples. NOTE: the colour chosen for the windows is only for illustration purposes. Be sure to select colour schemes that will render the texts and prompts in the application readable and suite user requirements. If you are not satisfield with the results, you can always reset the colours back to standard Microsoft Dynamics GP schemes. In order to assign colours to each company, be sure to log into that company and repeat steps 1 through 5.Happy colour coding! As a final note, I truly enjoyed working with David and Robert Cavill on this build and I am very proud of the final results. Support Debugging Tool is loaded with features that partners and customers should be taking advantage of. In the next few days I will be releasing some more articles with the capabilities built into the tool, please check in regularly for the updates. Support Debugging Tool Redux - This site. First Look at Support Debugging Tool for Microsoft Dynamics GP - This site. All other Support Debugging Tool articles - This site. This is really awesome stuff and Many clients would definitely love to have this feature. Great Work from you and Special Thanks to David Mussgrave whose contribution to GP innovation is priceless!!! Would each client installation need the support debugging dictionary for this to work, or can I install the SDB tool on one computer and change the color for everyone?